Nuclear Woes Push Japan Into A New Energy Future All of Japan's nuclear power plants will be offline by April and might never restart. That's forcing the country to increase its reliance on coal, oil and natural gas. This could cost the country an extra $100 million per day and significantly increase carbon dioxide emissions. The tsunami that struck Japan last year destroyed four nuclear reactors at the Fukushima Dai-ichi nuclear power station on the east coast of the country. Radiation spread through the air and into the ocean, and workers labored for weeks to quench the melting reactor cores. Farmland and numerous towns were evacuated and much remains off-limits. Since then, Japan has been temporarily shutting down its remaining nuclear plants as the public debates whether to swear off nuclear power permanently. But saying no to nuclear has been and will continue to be costly. Before the accident in Fukushima, Japan got a third of its electricity from nuclear reactors. That made economic sense — Japan has almost no coal, oil or natural gas to make electricity. Japan faces a choice — it can either restart its fleet of 54 nuclear power reactors or keep them offline. If the reactors stay offline, the country will need to meet energy demands by increasing the consumption of fossil fuels. Economist Mitsutsune Yamaguchi at the University of Tokyo says those nuclear power plants are now idle. "Out of 54 existing plants, only two are in operation, and by the end of April it will become zero," Yamaguchi explained in an interview in Washington, D.C. Yamaguchi has been on several government panels studying what to do about the country's energy dilemma. Several nuclear plants are still damaged from the quake and the rest have been idled as Japan sorts out what kind of energy it wants in the future. Yamaguchi says restarting nuclear plants is no longer just up to the central government. It's up to the public. "Even if government says, 'Yes, you can do it,'" he explains, "unless local mayors, governors or local residents say 'Yes,' power companies cannot start" the idled reactors. Meanwhile, the economy is taking a nosedive. For the first time in decades, Japan's vaunted trade surplus is gone. The country now spends more on imports than it earns from exports. What is Japan buying? Fuel. "The major utilities in Japan have increased their consumption of fuel oil by more than double," says Jesse Jenkins, an energy analyst at the Breakthrough Institute, a research group. The institute is in favor of nuclear power as a hedge against climate warming. Japan, says Jenkins, "has increased their use of liquefied natural gas by about 27 percent and relied more heavily on coal as a share of their energy use." And that's expensive. One analysis by the International Energy Agency in Paris says replacing the electricity from idled nuclear plants is costing Japan an extra $100 million a day. Then there are the climate effects. The nuclear reactors were not emitting carbon dioxide, the main greenhouse gas that contributes to global warming. Oil, coal and natural gas do. 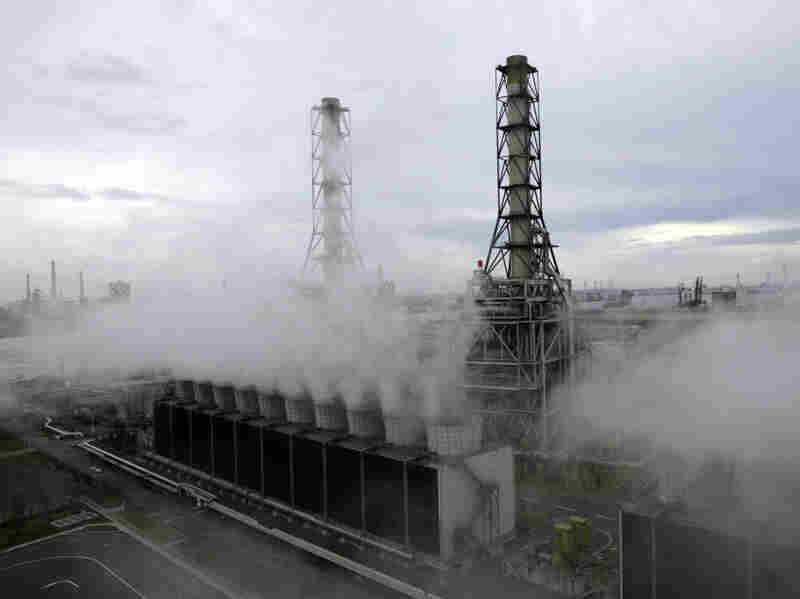 Steam rises from the Kawasaki natural gas power station in Kawasaki city, Kanagawa prefecture, on Aug. 25, 2011. Major utility companies in Japan have increased their use of liquefied natural gas by about 27 percent since the earthquake and nuclear disaster. Jenkins says Japan's goal to reduce carbon dioxide emissions is now shelved. In fact, emissions are going up. "They're swapping fossil fuels for nuclear and that's driving up their CO2 emissions and the carbon intensity of their electricity supply," he says. 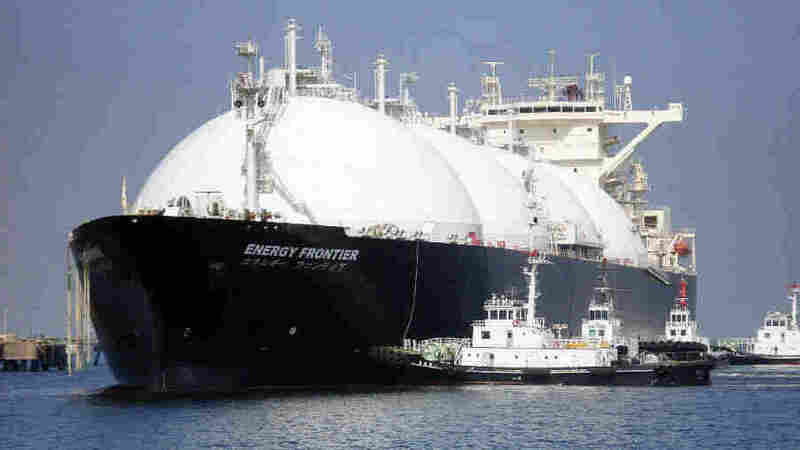 Most of the new fuel is liquefied natural gas. It's cleaner than coal or oil. but Laszlo Varro, with the International Energy Agency, says the amount needed if Japan doesn't return to nuclear power is staggering. "You would need almost 20 percent of the entire global market of liquefied natural gas," he calculates. Varro notes that a lot of that natural gas comes from the Middle East through the Straits of Hormuz, a shipping route threatened by tensions over Iran's nuclear ambitions. The Japanese government and green groups aren't happy about relying on fossil fuels, and there's strong sentiment to adopt a new energy mix that relies mostly on wind and solar power. That will take decades, though. Renewable energy in Japan now provides about 2 percent of the nation's electricity; nuclear provided 30 percent. In the meantime, as the economy recovers from the tsunami and earthquake, industry will need more electricity. The Japanese public will be asked to sacrifice, as they have over the past year. Yamaguchi says it's a daunting future. "It's a mess, you know," he laments. "We have to cut our consumption itself. We did it. But whether we can continue for the coming five, six, seven years without sacrificing the Japanese economy, it's almost impossible." But Japan has been through tougher times. Its engineers are second to none and the country is wealthy. The IEA's Varro says a wholesale shift to green energy isn't impossible. "It is certainly going to be expensive," he predicts. "How slow it is, that depends on the decisions that Japan makes. Japan is a rich and technologically sophisticated society. I think they have the potential to surprise us." After the nuclear accident last year, a Japanese word became popular in conversation: "setsuden." It means "energy-saving." Perhaps the next phrase to catch on will be: "necessity is the mother of invention."